Places to see in Chapramari FRH: You must spend the whole day watching the animals visiting the waterhole for their drink and the birds hopping from one branch of the tree to another. You are in the middle of the jungle and do not miss the thrill of it. There is a watch-tower adjacent to the Chapramari FRH where visitors come during the mornings and evenings. The watchtower and the Rest House offers the same view of the salt lick and the waterhole. Nearby attractions of Chapramari FRH: There are plenty of tourist attractions around and near Chapramari Wildlife Sanctuary like the Khunia watch-tower which is located within short distance of this sanctuary. 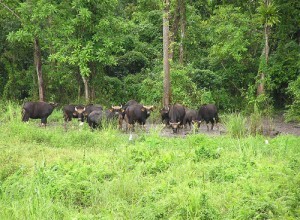 Other places to see are the Gorumara National Park and Jaldapara National Forest. The Murti River and Jhalong can also be visited as nearby attractions. The new destination of Panjhora located a few kilometers away on the banks of the Murti River on the fringes of Chapramari Forest has become a new attraction. 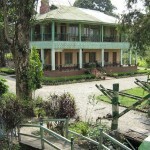 The entire Dooars region can be visited from this Chapramari Forest Bungalow. Things to do in Chapramari FRH: If you love nature, then this is your place. As soon as you enter the forest, you will see a wide variety of trees like aamloki, rudrapalash, rubber trees, rupasi and others. Bird watching can be a really exciting activity here with plenty of birds frolicking in the trees. You can sit idle on the balcony of the Chapramari FRH with a cup of tea enjoying the forest and the distant hills spotting wildlife around the waterhole and salt lick. In the evenings, you can watch the tribal dance and when the night falls and the Chapramari forest is bathed in moonlight, you can see the Elephant herd munching away the forest foliage beside your bungalow. How to reach Chapramari FRH: The Chapramari Wildlife Sanctuary is located some 72 km from Siliguri, 26 km from Lataguri, 70 km from Jalpaiguri and 8 km from Chalsa. National Highway 31 that passes by the sanctuary as it connects Nagrakata and Siliguri. You can easily reach the sanctuary by hiring cars either from the New Mall Junction or the rail station at New Jalpaiguri. If you are going by road, then you have to turn from the Khunia More on NH31that takes you to Jaldapara. 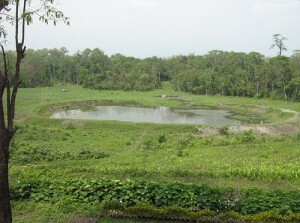 Best time to visit Chapramari FRH: You can visit the Chapramari Wildlife Sanctuary during any time of the year. 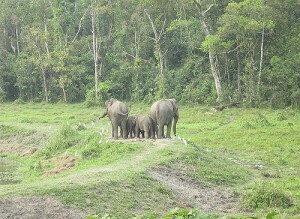 However, the Forest stays closed to visitors during the monsoons. Lodging and dining facilities at Chapramari FRH: The Chapramari Forest Rest House is the only accommodation available inside Chapramari Forest. 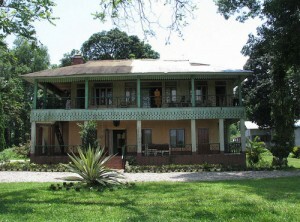 The bungalow has balconies facing the two salt licks and waterhole. Accommodation here is well furnished and well equipped with attached toilet, lights and fans and other facilities as well. There is a well proportioned dining hall also. Just remember, for staying in the Chapramari FRH, you have to carry your own ration, which will be prepared by the caretaker of the bungalow as per your request. I had been to Chapamari and the adjoining places some years back. It is a wonderful destination for nature lovers and one must not miss it. A senior citizen like will be the happiest person to re-visit the place. But, now a days it is difficult to find like minded and able bodied seniors or else to accompany and enjoy. Travelling alone is prohibitive because of the transport expenses involved.